Jon Krakauer’s 1996 book Into the Wild delved into the riveting story of Chris McCandless, a 24-year-old man from an affluent family outside Washington, D.C., who graduated with honors from Emory, then gave away the bulk of his money, burned the rest and severed all ties with his family. After tramping around the country for nearly two years, he headed into the Alaska wilderness in April 1992. His emaciated body was found a little over four months later. 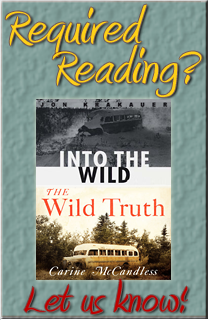 Krakauer’s book struck a nerve with readers. But he never fully answered what motivated McCandless’ ascetic renunciation, and the book drew scores of letters accusing him of arrogance, ignorance and selfishness. In a fascinating 2013 followup article in The New Yorker, Krakauer finally confirmed the cause of McCandless’ death: a toxic amino acid in wild potato seeds, previously thought to be benign. He hoped that the new findings would squelch some of those accusations. 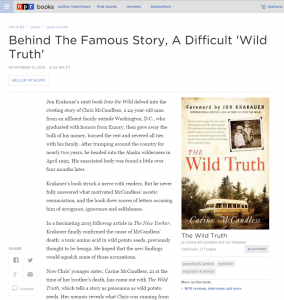 Now Chris’ younger sister, Carine McCandless, 21 at the time of her brother’s death, has come out with The Wild Truth, which tells a story as poisonous as wild potato seeds. Her memoir reveals what Chris was running from — and should lay to rest allegations that her brother’s behavior was cruel to their parents. Carine McCandless gets the grim truth out of the way up… See the complete story on NPR.com.